clouds in the sky, dandelion fuzz, and cotton candy. They were airy, fluffy things with a feeling of delicate transience. The things that fascinated us when we were girls don't change when we become adults. and an expression that overflows with happiness. fingertips look lovely as it creates eternal pure beauty. gently melts onto skin with airy texture and color. 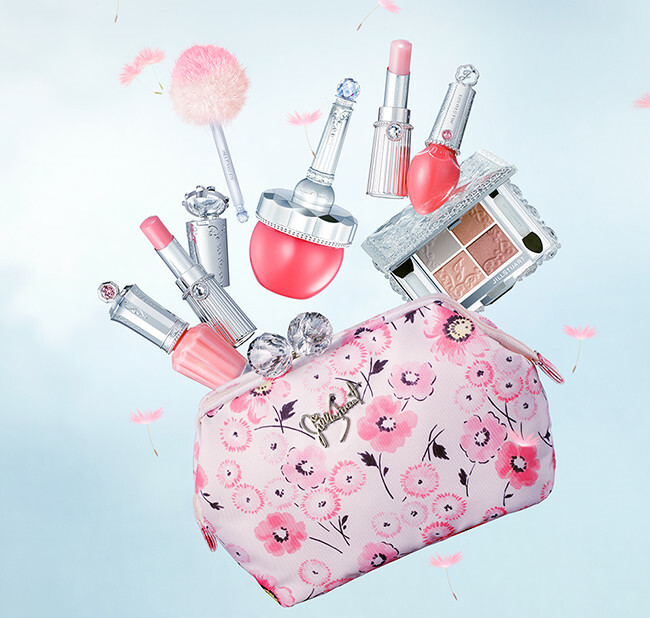 and enjoy this light makeup for Spring. Feminine right down to the gesture of applying it. Loose powder-type blush just like cotton candy. Light and soft texture, and pure color. Four-color matte eyeshadow sets for an elegant gaze. 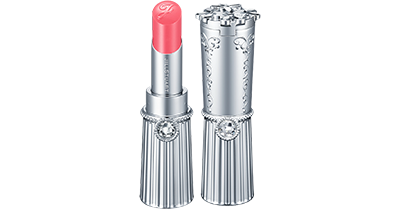 Imbue lips with pleasant and refreshing moisture. Lip balm that cares for roughness and chapping. Warm colors that announce the arrival of spring. Nail color to create gorgeous fingertips. Designed like flowers as light as fluff. 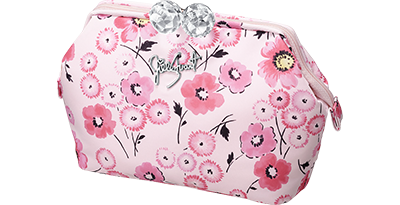 A lovely limited-edition pouch with sparkling crystal. Makeup with airy texture and color. 1. Using a finger or applicator tip, apply Matte Couture Eyes color A across the entire lid. Next, using the middle tip, apply colors B and C into the eye socket to create gradation. Finally, use the thin tip to apply color D to the corners of the eyes. 2. Apply Blooming Blossom Curl Lash Mascara from the roots to finish with natural-looking lashes. 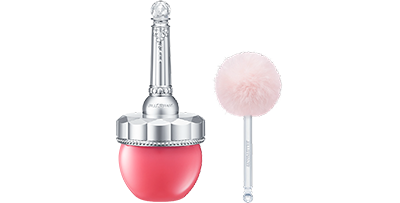 Take Loose Rouge onto the Puff Stick and apply to the cheeks from the centre outwards in round, light strokes. Apply Lip Blossom in a thin layer to the entire lip, then layer Forever Juicy Oil Rouge Glow in the centre and blend. This commemorative 25th year collection features a style that adds a modern touch to the archives of the past 25 years. The show featured dresses with beautiful airy see-through sections and the romantic flower patterns that are the signature of JILL STUART. BaseMakeAfter preparing skin with Secret Control, take a small amount of Cushion foundation onto a brush and blend softly. Apply Loose Blush 02 from the centre of cheeks outwards in small circles, then use Loose Blush 06 as a highlighter below the eyes and around the nostrils. Point MakeUse Kittenish Look Liner 01 to draw cat eyes from the center of the lower lids out to the corners. Using a calligraphy-type brush, extend this line out from the lower lid, then softly blur using a finger or cotton swab. Draw the line in almost as an outline, not just along the lashline. Use an eyelash curler to give lashes plenty of curl, then apply plenty of Blooming Blossom Curl Lash Mascara to create a strong look. 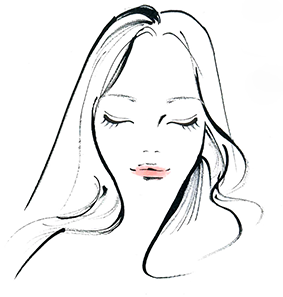 Use Secret Control to give the eyelids brightness, then layer Jelly Lip Gloss 08 over the entire lid to create shine. 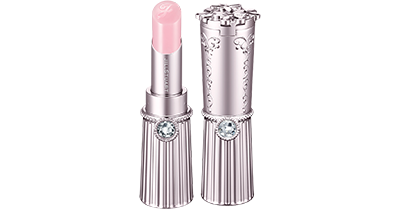 prepare the lips with Lip Glow Balm, then apply Lip Blossom in a Baby Pink color that matches skin tone. Finish by layering Secret Control for a matte look. This makeup style is built on a strong eye look and matte lips.